From hitchhiking to spending air miles, myriad ways to save money while you travel exist -- and, if you’re really clever, maybe even a way to score a free vacation. But if you’re looking for a guaranteed free trip, here's one of the easiest ways yet: just take a selfie. 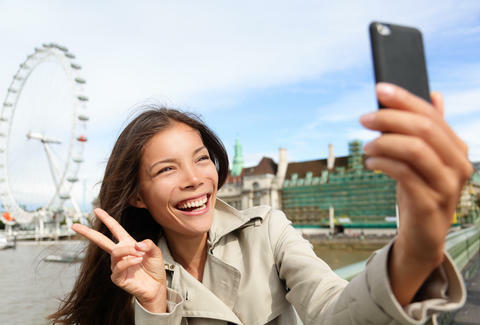 As part of a new contest, booking site CheapTickets.com is giving away six FREE trips to entrants with the best travel-selfie game. To win, all you have to do is enter here through Facebook or Instagram, and upload your old or new "trelfie" (what they’re calling travel selfies *shudder*) to the site’s interactive world map; you can post your submission under five categories: adventure; beach/pool; clubbing; group; and road trip. Then, post your selfie on social media and get your friends/followers to vote for yours. A panel of judges will select one grand prize winner, who will win five round-trip flight vouchers worth $1,650, as well as $1,000 to spend on any hotel bookings through CheapTickets.com. The sponsor will determine which airlines you'll be able to fly with, FYI. Pro tip: bonus points go to photos that demonstrate originality and promote budget travel. So selfies taken at a street food cart? Totally legit. Five finalists will be chosen, with one from each category, and the photo with the most votes in each wins. Winners will be rewarded with three round-trip flight vouchers, plus $500 to spend on a hotel stay. The sweepstakes deadline is April 13 at 12pm CT (or 1pm EST), so get snapping. But before you enter, just be sure to read the fine print, as certain annoying taxes and fees aren’t waived in your prize. And one last word of friendly advice: please, just don’t be one of these people.